I used to listen to Thriller while visiting the dentist office in the 80's, so that should qualify me as an expert on Michael Jackson memorabilia. From robot heads to golf carts—everything must go! 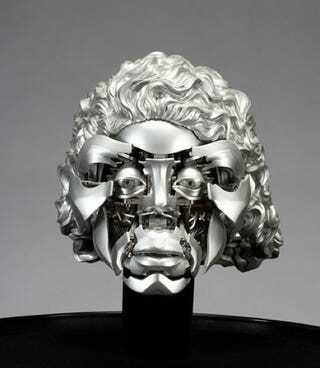 For $2000-$3000 you can take home this robot head from the climatic scene from Moonwalker. It still animates and lights up at the push of a button. I have to admit, that is pretty damn cool. MJ's Brevetti Gaggia espresso and cappuccino machine features "polished chrome with bands of repousse and reticulated brass. Tank bears a Neverland plaque, is flanked by decorative Turkish tea vessels and is crested by an eagle finial." The king of Pop's coffemaker will set you back $1000-$2000. A coin-operated Grandmother Predictions fortune teller runs $1500-$2000. Edward Scissorhands prop gloves are running for $4000-$6000. Michael Jackson identified with a movie about a misunderstood freak? Do tell. This Sega flight simulator features a safety barrier and attendant station. Price: $4000-$6000. Michael's golf cart features Peter Pan cushions and an image of himself as Pan on the hood. Oh yes, yes it does...$4000-$6000.